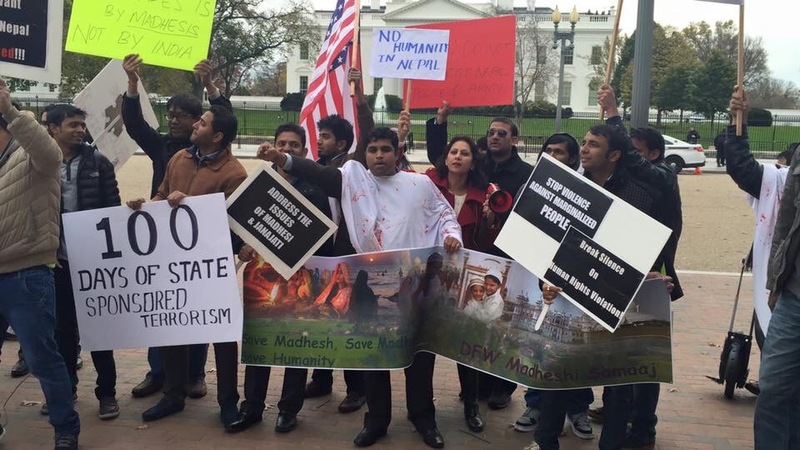 Nepalis from Madhesi and Janajati communities protested in Lafayette park, outside White House in Washington DC today from 9 AM till 3 PM. They protested against oppressive policies of the Nepal government and commemorated 100 days of protests by Madhesis, Tharus and other ethnic communities in Nepal. The event was organized by Association of Nepali Teraian in America (ANTA) and Madhesh Human Right (MADHUR). The protesters demonstrated banners and chanted slogans to stop killing of Madhesis – people from the southern plains – in Nepal and amend Nepal’s constitution pertaining to discriminatory clauses. They also proclaimed that Madhesis, not India, will continue to block the border until their legitimate demands are met. 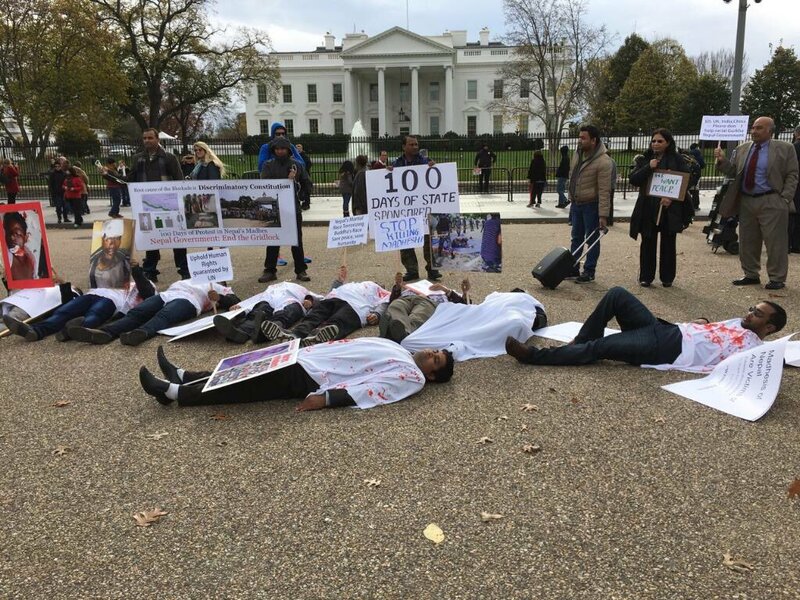 In a symbolic move to mimic the brutal and extra-judicial killing of unarmed Madhesis by Nepal Police and Armed Police Force (APF), the protesters clad themselves in white clothes stained with red color as a symbol of blood, and posed as corpses on the street outside the White House. “About 70 people – both Madhesis and Pahadis, attended the event. Some of us were clad in blood (red color) soaked white cloth ‘kafan’ to symbolize the funeral procession of Madhesi martyrs,” said Satendra Sah, a member of ANTA. Just a day before this protest, four civilians were shot and killed by security forces in Saptari, Nepal, one of those killed was a mere spectator. Dilip Shah was killed while seated on the terrace of his second floor house and his eight year old daughter was also shot and injured. According to a NHRC report that surveyed 28 districts in Nepal, 32 civilians including five children have been gunned down by security forces. Similarly, nine security personnel have been killed by protesters. An Indian national was also shot dead by security forces on November 2, 2015. Several human rights organizations such as Human Rights Watch, Amnesty International, and The Terai Human Rights Defenders Alliance have documented excessive use of force by Nepal’s security personnels, in violation of Local Administration Act-2028, Clause (6), sub-clause (b). This clause prohibits security personnel from shooting at civilians during crowd control above knee, in accordance with Universal Declaration of Human Rights. Nilu Jha, a resident of Janakpur who identifies herself as both a Pahadi and a Madhesi came to the protest despite her eight year old child being sick since three days. When she heard of the news that a child was killed in Saptari, Nepal a day before the protest, she could not resist herself. During the event, signatures were collected which will be sent to the United Nations for review and action. Similarly, pamphlets were distributed to visitors and onlookers, informing them about the discrimination and human rights violations in Nepal. Several guest speakers, including Dr. Sukh Dev Shah also spoke during the event and stressed on the importance of putting a temporary halt to funding of Nepal Police and APF. Other speakers at the event included: Dr Hari Bansh Jha, Ram Manohar Sah, Vijay Singh, Vijay Yadav, Bal Krishna Jha, Arvind Singh, Dr Jay P Sah, Pramod Jayswal, Chandan Singh, and Vijay Chandra. 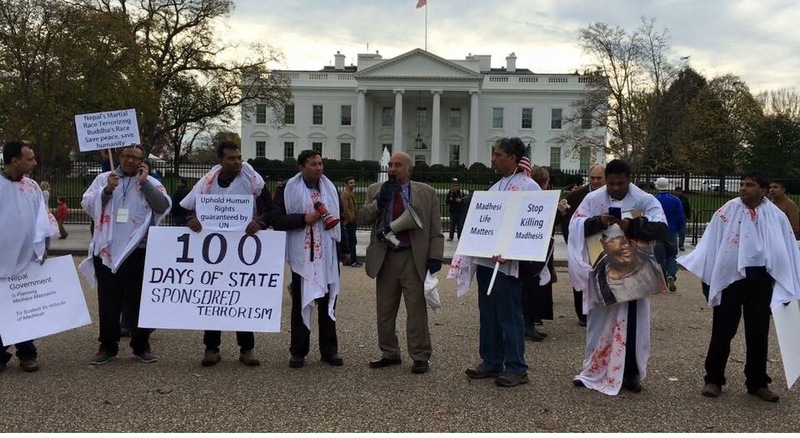 Coincidentally, another group of Nepalis of Pahadi origin also protested in Washington DC but their agenda was completely opposite. They chanted slogans against India and alleged that India is complicit with Madhesis in imposing the ‘blockade’ which is making lives miserable in Nepal. The video posted by Pradeep Thapa on his facebook offers a glimpse of the tension that built after the two Nepali groups with opposite agenda came in close vicinity of each other. Thankfully, the protest continued to be peaceful and no unfortunate incidents have been reported. 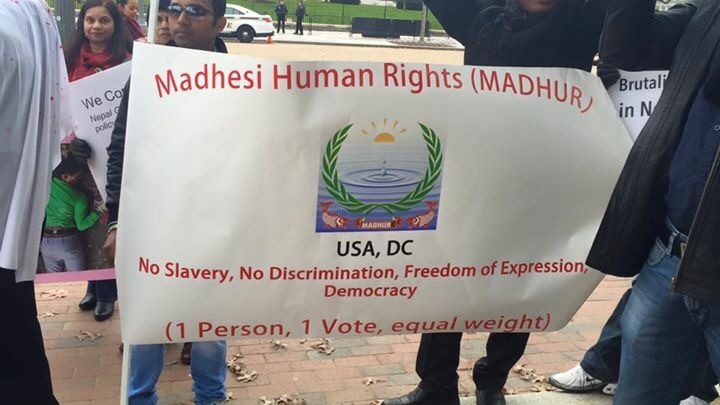 The Madhesi and Janajati protesters in the US expressed solidarity with the Madhes Andolan in Nepal. They also aimed to bring attention of the international community to the worsening crisis in Nepal and sought assistance for a resolution sooner than later. (With Video) Citizens Marched to Parliament in Capital to Pressure Govt.